Ginger is the only source of a two groups of phenolic compounds called gingerols and shogaols, but also contains other polyphenols in significant quantities such as galic acid. It is the gingerols and shogaols which give ginger root its flavour, making it a popular ingredient to cook with. Aside from its flavour, ginger has long been used in traditional medicine to help treat a variety of aliments, and recently has become popular as a dietary supplement which is claimed to reduce inflammation, protect against cancer, help the body regulate blood sugar and protect against oxidative stress. Ginger and its phenolic compounds have attracted much clinical research recently to investigate these health claims, and because many pharmaceuticals remedies originate from compounds isolated from plants. The most commonly known example of this salicylic acid, which is the active ingredient found in aspirin and was originally isolated from willow bark after it was observed that a tea made from willow bark help relive pain. This literature review will look at all the current clinical trials investigating how the active components of ginger can interact with our body, whether or not it has beneficial properties, and what dosages are effective if there are any beneficial properties are identified. The most abundant gingerol found in ginger is 6-gingerol, but there are also smaller quantities of analogues such as 8-gingerol and 10-gingerol. All gingerol compounds have a similar structure, and behave very similarly in the body, but their potency can vary slightly. The differences in their structure can be seen below. Ginger, particularly dried ginger will also contain another group of compounds called shogaols. Shogaols are anhydrous (dehydrated) gingerols, and so are commonly formed when ginger is dried. They are structurally similar to gingerols, but despite this they can behave differently in the body. 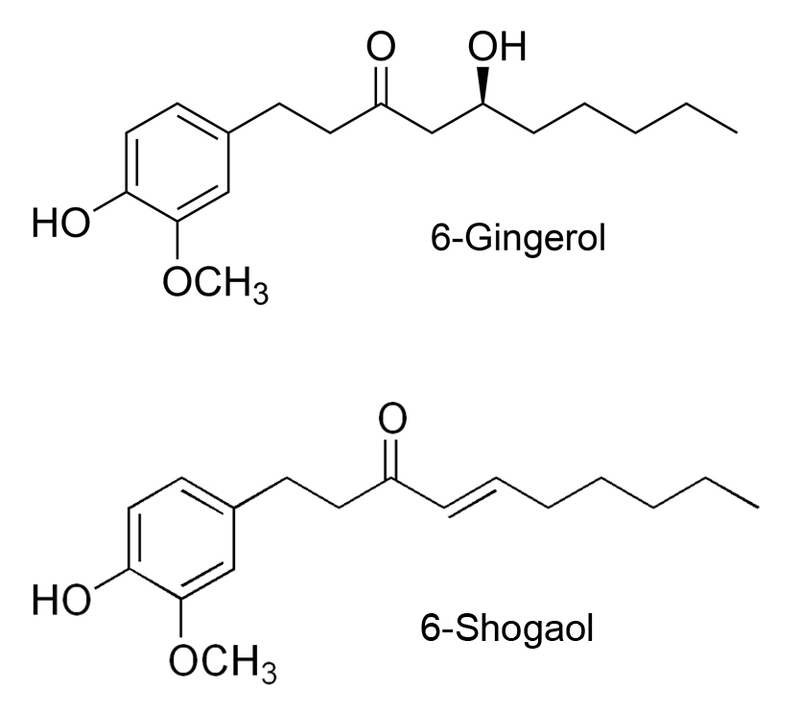 A comparison of the structure of 6-gingerol and 6-shogaol is shown below. A number of health claims for ginger revolve around its ability to scavenge free radicals, because a reduction in oxidative stress on the body is associated with reducing the risk of a number of ailments including cancer and inflammation. The structure of gingerols is very typical of antioxidants, which suggests that gingerols will posses antioxidant properties. Laboratory investigations have confirmed this on a number of occasions, and shown that gingerols do have antioxidant properties, with 6-gingerol being the most powerful (N Pawar et al, 2011) (C Lee et al, 2011) (S Dugasania et al, 2010). Although human trials have not confirmed this, it is very difficult to measure antioxidant capacity of a specific molecule in humans, so it is not surprising to find no human studies. Gallic acid, a polyphenol which is abundant in ginger has also shown powerful antioxidant properties, which have been shown to specifically offer protection against nerve cells, offering potential protective effects against neuro-degenerative diseases, although this requires more research (Z Lu et al, 2006). Shogaols, which are less abundant in fresh ginger but found in higher concentrations in dried ginger are likely to have similar antioxidant properties to gingerol, but there is no evidence for this other than their structure, which has typical traits of antioxidant compounds. Gignerols and gallic acid do posses significant antioxidant properties, and are able to scavenge a range or radicals. This will help support our natural antioxidant savaging systems and dietary antioxidants in the body, which is offer protection against a number of diseases. A lesser mediator of inflammation is a cytokine called tumour necrosis factor alpha (TNF-α), which contributes to the development of acute inflammation. Extracts of both gingerols and shogaols have been shown to have no effect on the production of TNF-α, yet ground ginger has been shown to inhibit TNF-α (R.C. Lantz et al 2007). This demonstrates a benefit of whole ginger over ginger extract when acting as an anti-inflammatory agent. It would seem there is one or more other active compounds found in ginger which are responsibly for inhibiting TNF-α. It is possible that TNF-α is inhibited by the other phenolic compounds which are found in ginger such as gallic acid. Indeed, gallic acid has been shown to inhibit TNF-α (S H Kim et al, 2006), and it is abundant in dried ginger. The evidence showing that gingerols, shogaols and gallic acid all inhibit the production of a variety of pro-inflammatory mediators supports the anti-inflammatory claims for ginger. Another popular health claim for ginger is its ability to protect against cancer. By reducing inflammation in the body and offering protection against free radicals, ginger will offer some protection to cancer, but additional protective effects of the components of ginger have been reported from a number of studies. A review on the current evidence for the cancer protective properties of ginger was conducted in 2007 by Y Shukla et al, who concluded that in a number of experimental models active components found in ginger did exhibited anti-cancer properties. Further investigations have solidified this conclusion by identifying mechanisms by which gingerols and shogaols can offer these protective benefits. 6-Gingerol has demonstrated an ability to inhibit the action of enzymes MMP-9 and MMP-2 (H S Lee et al, 2008), both in animal trials and in in laboratory studies with human cells. In cancer cells, these enzymes are associated with the cancer migration and invasion (O Mendes et al, 2007), which takes part in late stage cancer development. When investigation 6-gingerol with breast cancer cells, the inhibition of these enzymes was associated with a dose dependent reducing in cancer cell invasion. In the laboratory study, dosages of approximately 3mg of 6-gingerol reduced invasion and spread of cancerous cells by 16%, and as the dosage increased, so would the amount of reduced invasion. (H S Lee et al, 2008) It is unknown if the same dosages will give the same level of reduced invasion in vivo, but these studies have shown that 6-gingerol inhibits MMP-9 and MMP-2, which can reduce the invasion and spread of cancer cells. A common risk factor for the development of cancerous cells is DNA damage, particularly from reactive nitrogen species such as nitric oxide (NO) and its derivatives. In laboratory studies 6-gingerol has demonstrated an ability to reduce NO production, which will reduce oxidative stress. 6-Gingerol has also been shown to be an effective protector against an extremely harmful nitric oxide derivative called peroxynitrite (K Ippoushi et al, 2003). By protecting the body against these DNA damage from these nitric oxide derivative, 6-gingerol can help reduce the risk of developing cancerous cells. There is also some evidence to suggest that ginger can directly induce apoptosis in cancer cells, although evidence for this specific claim is limited. 2 studies have shown that 6-gingerol and 8-shogaol are able to induce apoptosis in leukemia cells (P C Shieh et al 2010) (E Lee et al, 1998), but it is unclear if the same results can be expected with other types of cancer, or even if the same results can be expected in vivo. Much more research is needed into gingers potential to induce apoptosis in cancer cells, but preliminary tests are positive. The final claim under review in this research is the ability to help the body regulate blood sugar levels, which will be beneficial for people suffering from type 2 diabetes or those at risk of developing type 2 diabetes. Although there is limited research on this topic, the current research is very promising. A recent double blind placebo study showed that 3g of ginger over a 8 week trial period significantly improved insulin sensitivity measured on the QUICKI (quantitative insulin sensitivity check index) (HMozaffari-Khosravia et al, 2014). Although this is the only study of its kind supporting this, being a double-blind placebo study eliminates the chance of the results being a result of the placebo effect, and is considered to be the ‘gold standard’ in clinical research, making its findings very relevant. Animal studies have suggested that 8-gingerol is the most significant component of ginger in helping the body to regulate blood sugar and offer protective effects against type 2 diabetes, but this has not been confirmed with human studies (Li Y et al, 2012). The major phenolic compounds found in ginger are gingrols, gallic acid and shogaols, and there is compelling evidence showing that these compounds have significant antioxidant and anti-inflammatory properties, and can also help the body regulate blood sugar. 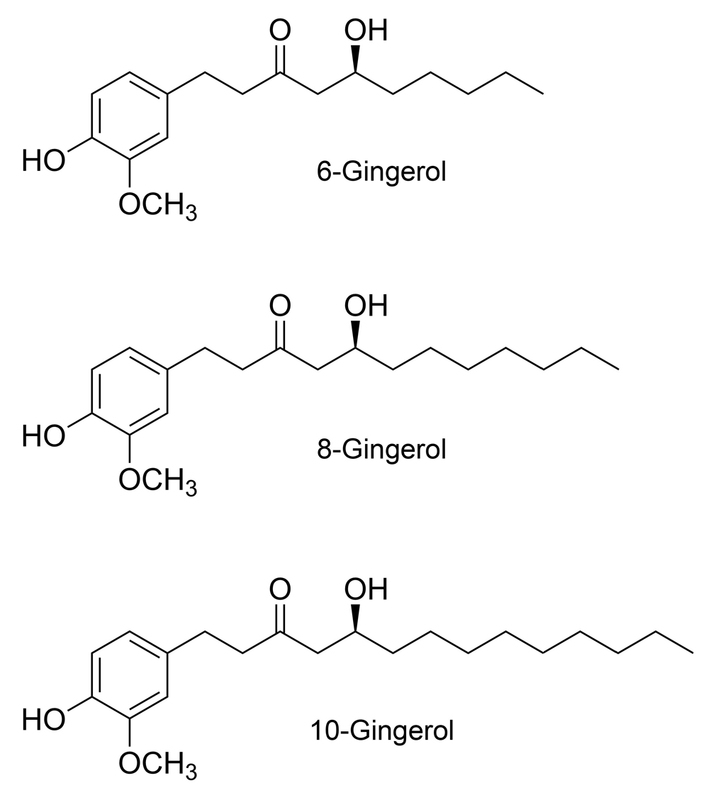 Gingerols and gallic acid will also offer protection against the development of cancer cells by offering antioxidant protection, which will reduce DNA damage, and current research on the ginger and cancer suggests that it may also be able to prevent cancer cell migration, and might be able to induce apoptosis in some cancer cells. However, due to the complexity of cancer development, and the limited amount of research on ginger and cancer, the extent of protection ginger may offer is inconclusive. Chan Lee, Gyu Hwan Park, Chang-Yul Kim, Jung-Hee Jang. (2011). -Gingerol attenuates β-amyloid-induced oxidative cell death via fortifying cellular antioxidant defense system. Food and Chemical Toxicology. 49 (6), 1261-1269. Chariat Puengphian and Anchalee Sirichote. (2008). 6-gingerol content and bioactiove properties of ginger (zingiber officinal Roscoe) extract from supercritical CP2 extraction. Asian journal of food and agro-industry. 1 (1), 29-36. Eunyong Lee and Young-Joon Surh. (1998). Induction of apoptosis in HL-60 cells by pungent vanilloids, -gingerol and -paradol. Cancer letters. 134 (2), 163-168. Hassan Mozaffari-Khosravia, Behrouz Talaeia, Beman-Ali Jalalib, Azadeh Najarzadeha, Mohammad Reza Mozayan. (2014). The effect of ginger powder supplementation on insulin resistance and glycemic indices in patients with type 2 diabetes: A randomized, double-blind, placebo-controlled trial. Complementary therapies in medicine. 22 (1), 9-16. Hyun Sook Lee, Eun Young Seo, Nam E Kang, Woo Kyung Kim. (2008). -Gingerol inhibits metastasis of MDA-MB-231 human breast cancer cells. The Journal of Nutritional Biochemistry. 19 (5), 313-319. Katsunari Ippoushi Keiko Azuma, Hidekazu Ito, Hideki Horie, Hisao Higashio. (2003). -Gingerol inhibits nitric oxide synthesis in activated J774.1 mouse macrophages and prevents peroxynitrite-induced oxidation and nitration reactions. Life Sciences. 73 (26), 3427-3437. Li Y, Tran VH, Duke CC, Roufogalis BD.. (2012). Gingerols of Zingiber officinale enhance glucose uptake by increasing cell surface GLUT4 in cultured L6 myotubes.. Planta med. 78 (14), 1549-1455. Mendes O, Kim HT, Lungu G, Stoica G.. (2007). MMP2 role in breast cancer brain metastasis development and its regulation by TIMP2 and ERK1/2. Clin Exp Metastasis. 24 (5), 314-315. Nilesh Pawar, Sandeep Pai, Mansingraj Nimbalkar, Ghansham Dixit. (2011). RP-HPLC analysis of phenolic antioxidant compound 6-gingerol from different ginger cultivars. Food Chemistry. 126 (3), 1330-1336. Po-Chuen Shieh, Yi-Own Chen, Daih-Huang Kuo, Fu-An Chen, Mei-Ling Tsai, Ing-Shing Chang, Hou Wu, Shengmin Sang, Chi-Tang Ho and Min-Hsiung Pan. (2010). Induction of Apoptosis by -shogaol via Reactive Oxygen Species Generation, Glutathione Depletion and Caspase Activation in Human Leukemia Cells. Journal of agric food chem. 58 (6), 3847-3854. R.C. Lantz, G.J. Chen, M. Sarihan, A.M. Sólyom, S.D. Jolad, B.N. Timmermann. (2007). The effect of extracts from ginger rhizome on inflammatory mediator production. Phytomedicine. 14 (2-3), 123-128. Reinhard Grzanna, Lars Lindmark, Carmelita G. Frondoza, Ph.D. (2005). Ginger—An Herbal Medicinal Product with Broad Anti-Inflammatory Actions . Journal of Medicinal Food. 8 (2), 125-132. Sang-Hyun Kim, Chang-Duk Jun, Kyongho Suk, Byung-Ju Choi, Hyunjeung Lim, Seunja Park, Seung Ho Lee, Hye-Young Shin, Dae-Keun Kim and Tae-Yong Shin. (2006). Gallic Acid Inhibits Histamine Release and Pro-inflammatory Cytokine Production in Mast Cells. Toxicology science. 91 (1), 123-131. Schwertner HA, Rios DC, Pascoe JE. (2006). Variation in concentration and labeling of ginger root dietary supplements. 1. Obstet Gynecol. 107(6):1337-43. Su-Chen Ho, Ku-Shang Chang, Chih-Cheng Lin. (2013). Anti-neuroinflammatory capacity of fresh ginger is attributed mainly to 10-gingerol. Food Chemistry. 141 (3), 3183-3191. Swarnalatha Dugasania, Mallikarjuna Rao Pichika, Vishna Devi Nadarajahc, Madhu Katyayani Balijepallic, S. (2010). Comparative antioxidant and anti-inflammatory effects of -gingerol, -gingerol, -gingerol and -shogaol. Journal of Ethnopharmacology. 127 (2), 515-520. Yogeshwer Shukla and Madhulika Singh. (2007). Cancer preventive properties of ginger: A brief review. Food and Chemical Toxicology. 45 (5), 683-690. Zhongbing Lu, Guangjun Nie, Peter S. Belton, Huiru Tang, Baolu Zhao. (2006). Structure–activity relationship analysis of antioxidant ability and neuroprotective effect of gallic acid derivatives. Neurochemistry International. 48 (4), 263-274.